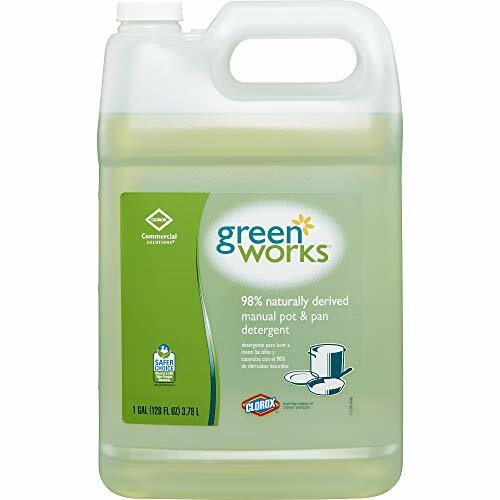 Green Works Manual Pot & Pan Detergent is made using effective naturally derived ingredients, such as essential oils and plant-based cleaning agents, to create a 98% naturally derived cleaner that is gentle on hands. The formula is versatile for all your manual-ware washing needs and as a general cleaner and degreaser. The detergent is suitable for pots, pans, dishes, glassware, flatware, plastic containers as well as surfaces such as stainless steel. From Clorox Commercial Solutions, the dishwashing liquid is ideal for use in commercial kitchens, office break rooms, school cafeterias and other foodservice facilities. Made from plant and mineral-based ingredients, the product is recognized by the EPA's Design for the Environment (DfE).